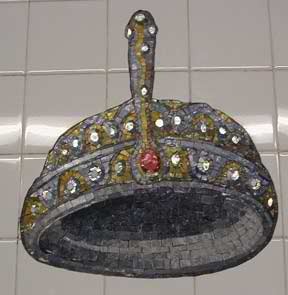 I still favor New York’s subway stations over others I have been in in Chicago, Philly and Boston. 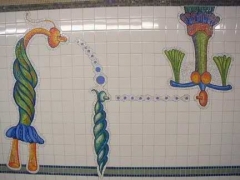 Boston‘s stations have a uniform charm (the Red, Orange, Blue and Green Lines are awash in their respective colors) while Chicago‘s subway stations are minimally appointed; the real sights can be found at the city’s numerous elevated stations, which are undergoing a renaissance. 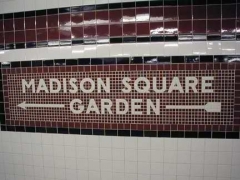 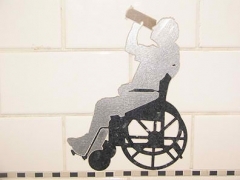 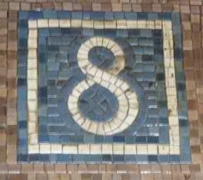 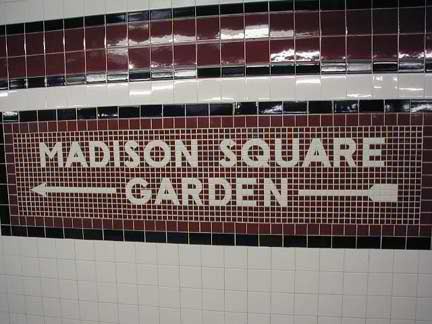 What makes New York City’s stations stand apart is the overwhelming use of tile and mosaics, initiated by subway art director/engineer Squire Vickers in the 1910s, at the end of the Arts and Crafts era, and continued by him into the 1930s, with the IND’s precise Machine Age graphics. 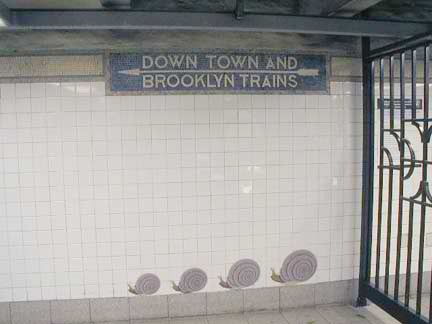 After Vickers was gone, the subways seemed rootless, with a wide variety of different schemes, some effective, some not. 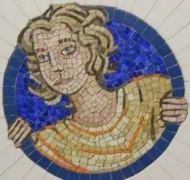 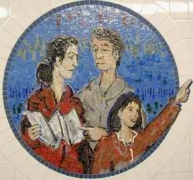 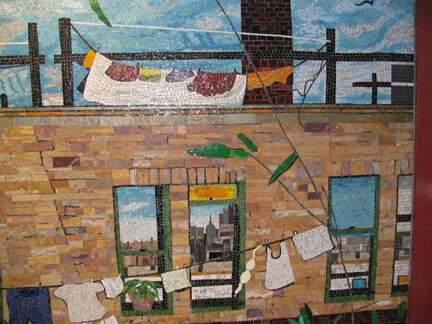 In recent years, the MTA has restored much of Vickers’ work, especially along the BMT Broadway line, and new mosaic installations have appeared that seem to extrapolate Vickers’ ethos, adapting it to a more playful, innovative age, with additional colors and images. 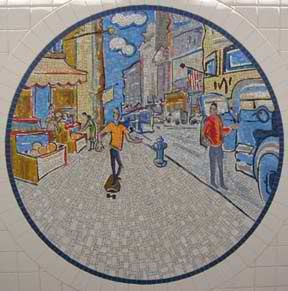 Let’s check just a few of the many incredible new mosaic installations that have sprung up recently. 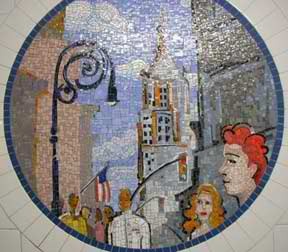 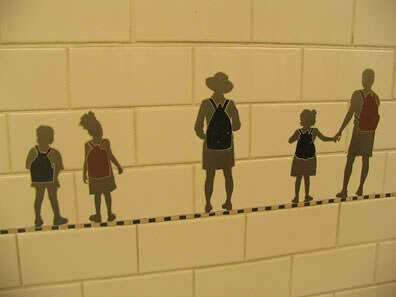 Timothy Snell’s “Broadway Diary” at the BMT 8th Street station was installed in 2002. 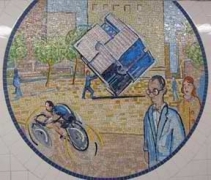 Following the Vickers example of depicting present or past scenes in station mosaics, Snell here shows neighborhood landmarks, like NYU, the Peter Cooper statue and even Tony Rosenthal’s Alamotilted cube at Astor Place and Cooper Square. 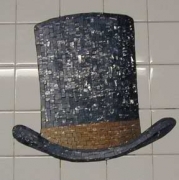 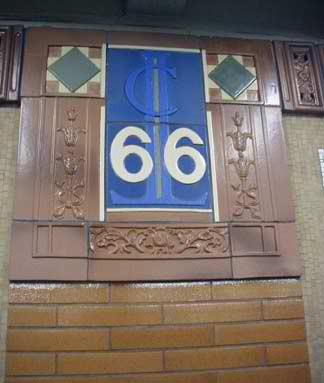 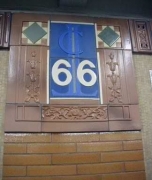 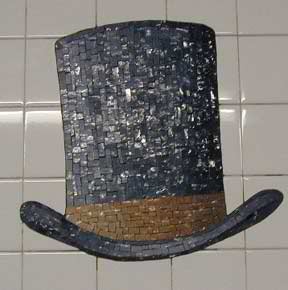 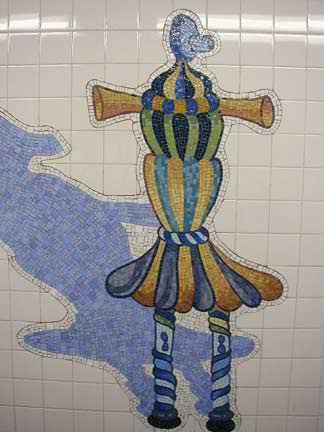 In a station remake in the early 2000s, the 1960s blue and white cinderblocks were removed, once again revealing Vickers’ subtly colored station mosaics. 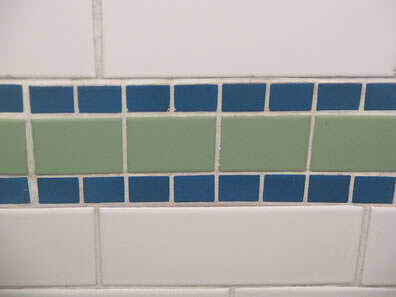 The remakes added colored stripes along the bottom of the walls, in harmony with Vickers’ original palette. 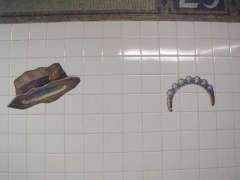 Keith Godard’s “Memories of 23rd Street” (BMT) was unfinished when I shot it in late 2003, but the notations indicate that every hat on the wall has a name. 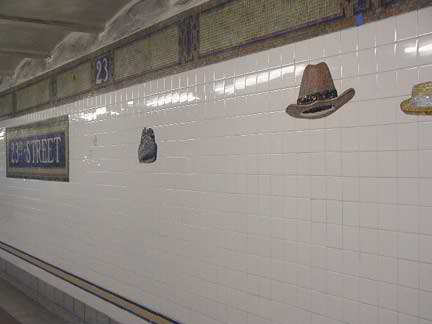 Forgotten Fan Andrew Boynton guesses that the flying hats are emblematic of the famously windy corner, 5th and 23rd, above. Godard assisted with a design for the World Trade Center memorial, designed an exhibit design for the Children’s Museum of Manhattan, signage and banners for Lincoln Center, custom street carts for the Times Square Business Improvement District, numerous proposals for UN exhibits, and much more. 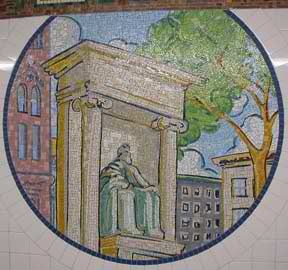 He has taught at FIT and Cooper Union. 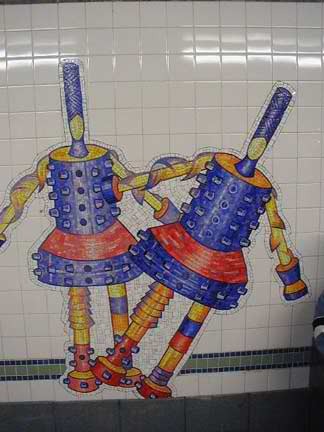 At 28th Street (BMT), Mark Hadjipateras’ “The City Dwellers” appear to be toys gone wild, or perhaps aliens approximating human form, never having seen us but having to replicate our forms by what they’ve heard. 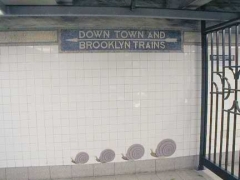 Hadjipateras and his creations are the subject of a documentary video, “City Dwellers,” directed by Valerie Kontakos, while animator Scott Winston has used these figures in an animated film. 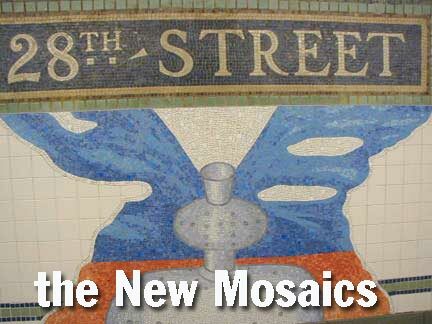 It’s not a mosaic actually, but Prince Street, like its sister local stations on the BMT Broadway line (8th, 23rd, 28th) has had ingenious art applied to its walls. 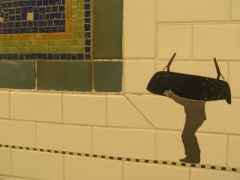 Artists Janet Zweig and Edward del Rosario employed cut metal, slate and marble, as well as photographs of New Yorkers walking in the above street, to create 194 portraits in an installatio called “Carrying On”. 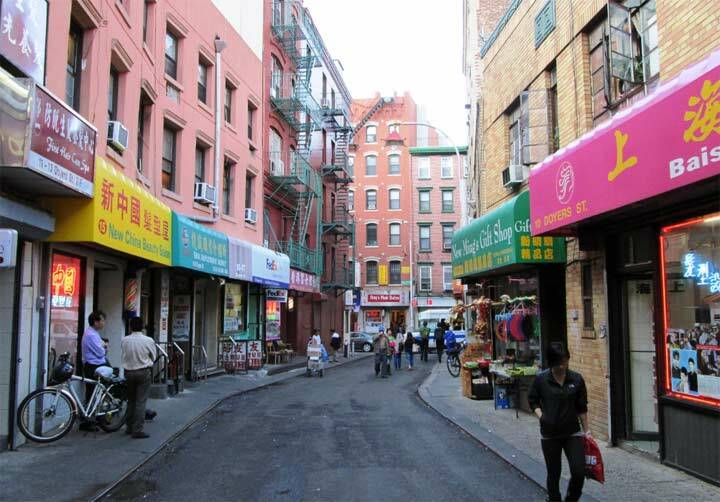 Prince Street has also been given colored horizontal stripes in navy and sea-green to get it in line with 8th, 23rd and 28th. 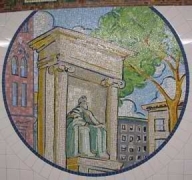 Frank Leslie Hampton’s “Uptown New York” at the Tremont Avenue station (B, D). 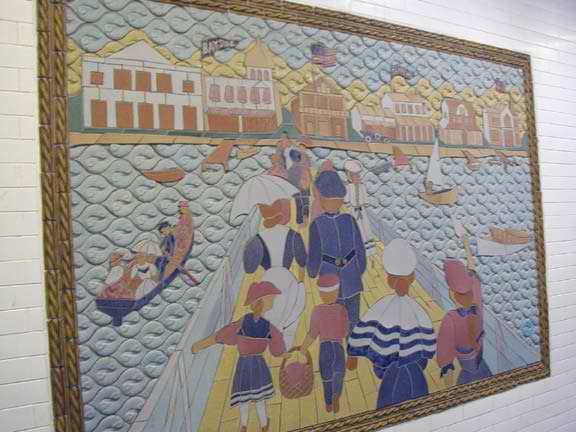 The mural actually fills the mezzanine: this is only a small part. If they’re right about global warming, NYC will be under water in a couple of centuries and this scene on the IRT Houston Street platform, Deborah Brown’s “Platform Diving,” could actually take place. 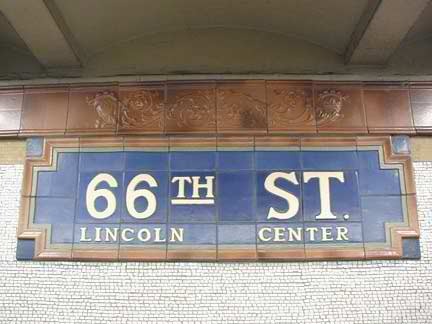 The original Heins and LaFarge subway stations, opened in 1904 between the old City Hall station and 145th and Broadway, have neen marvelously updated in recent years (we will discuss them indetail on a future page) but 66th/Lincoln Center has received an especially through makeover, with additions to the original terra cotta (note the “LC”) and Nancy Spero‘s “Artemis, Acrobats, Divas and Dancers.” The overall station renovation is by architect Lee Harris Pomeroy and was completed in 1999. 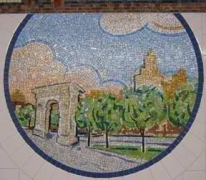 As seen elsewhere on this page the best new subway mosaics interact seamlessly and are of a piece with the originals from the 1910s. 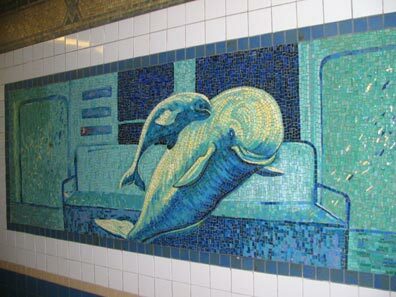 At the Fifth Avenue BMT station (at 60th Street) we have Ann Schaumburger’s “Urban Oasis” depicting wildlife, similar ro the glass mosaic murals at the IND 81st Street station, created by the MTA’s Arts for Transit staff. 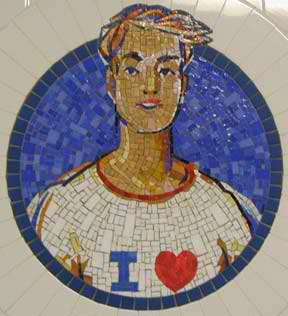 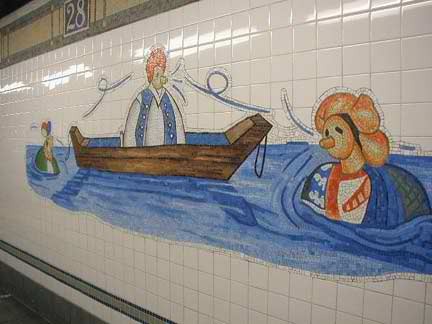 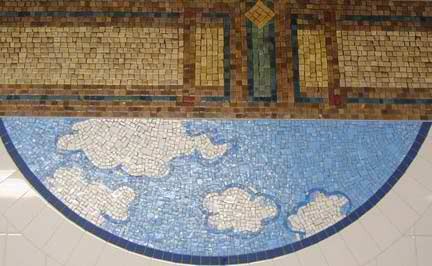 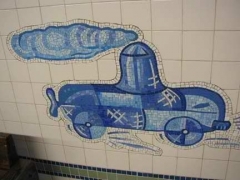 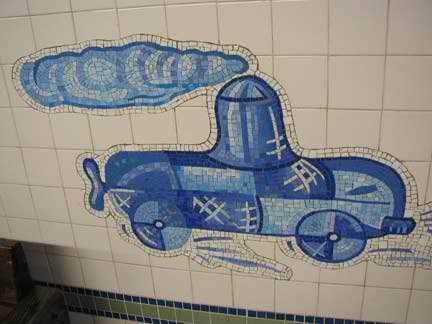 Not all the new subway art is mosaic. 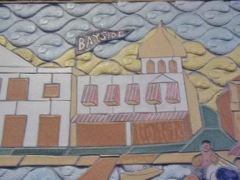 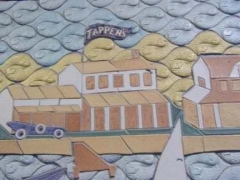 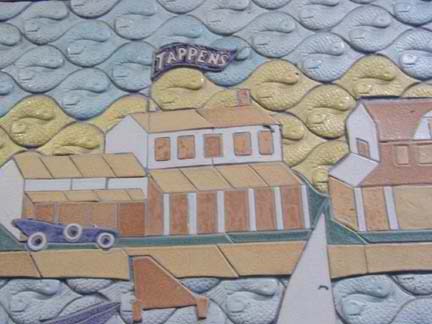 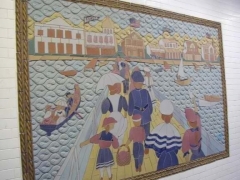 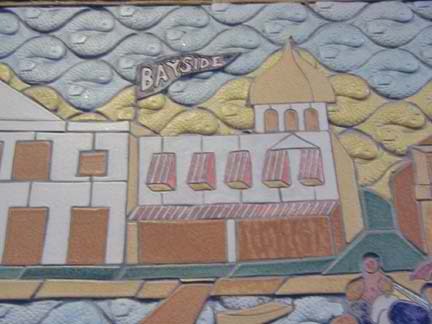 DeBorah Goletz‘ “Postcards from Sheepshead Bay,” a group of ceramic murals, shows the area as it was about 1913, with the Bayside Hotel at Emmons and Ocean Avenues, the Tappen Hotel at Emmons and East 27th Street, and he Ocean Avenue footbridge which is still there. As we’ve seen, showing a neighborhood as it was is a tradition going back to the subway archiect and engineer from the 1910s-30s, Squire Vickers. 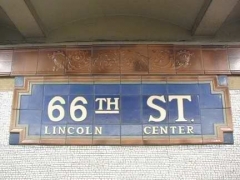 Some of the transit buffs I’ve met are not fans of Vickers’ 1930s IND color-coded designs; befitting the styles of the era, the old, more ornate and busy signage has been boiled down to color plates with, in most cases, darker borders. (In later years the minimalist bent would be taken to extreme, with black-on-white and later white-on-black signs.) 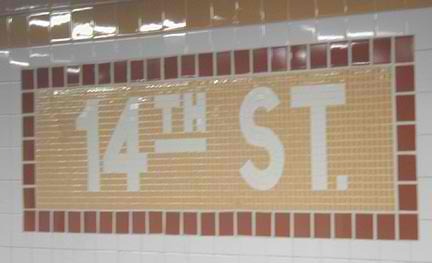 In recent years the MTA has begun to rethink the maligned IND templates, designing new ones at 14th, 34th, and Canal Street stations. 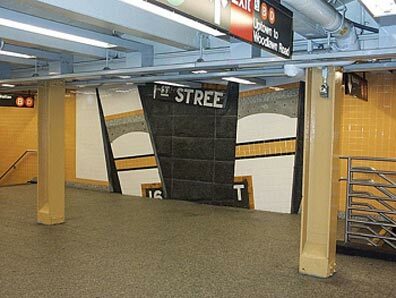 At the IND 161st Street/River Avenue station, poet/artist Vito Acconci‘s “Wall Slide” pokes a little fun at Vickers’ design, taking it apart and putting it back together rather differently. 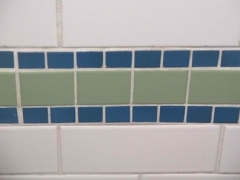 There are gold tiles where white should be and vice versa. 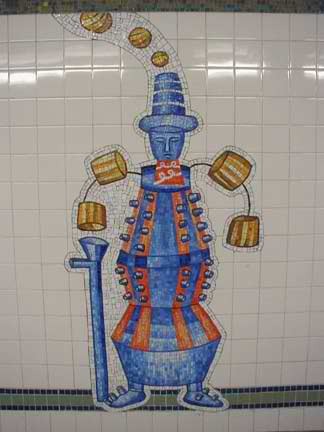 All recent transit art can be seen at the MTA’s Arts for Transit page, and much more can be seen at the individual stations pages at nycsubway.org. 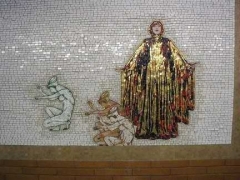 Nycsubway.org has a new page with a comprehensive view of subway art in 132 stations. Photographed late 2003 and early 2004. 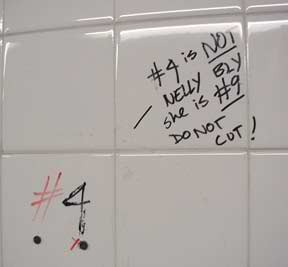 Page written June 19, 2005.